1. Preheat the oven to 180˚C, gas mark 4. Brush the holes of a 12-hole muffin tin with the extra butter, then dust each hole with flour, shaking out any excess. 2. Mix together the flour, ground almonds, icing sugar and a good pinch of salt in a large bowl. In a separate bowl, use a fork to lightly whisk the almond extract into the egg whites. Slowly mix the egg whites into the bowl of dry ingredients, combining with the fork as you go. Mix in the butter until just combined. 3. Transfer the batter to a large jug and pour evenly into the muffin holes. Put a blackberry on top of each (they’ll sink as they bake, so there’s no need to push them down). Bake for 30-35 minutes, until just golden. Leave in the tin for 5 minutes before turning out onto a wire rack to cool (you may need to use a table knife to help ease them out). Dust with a little icing sugar before serving. 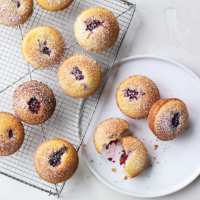 You can use any summer berry in the friands; also try scattering them with flaked almonds before baking.